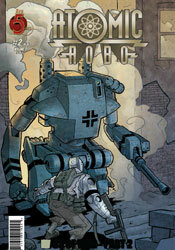 One of Nikolas Tesla's finest (and quietest) creations, Atomic Robo is the first and so far only example of artificial intelligence to walk the planet. Granted American citizenship in exchange for his occasional cooperation with the US military, Robo spends his time battling enemies either dubbed too powerful or too strange for average troops to approach. It's a bit of the former, a bit of the latter this time around, as the metal man is dropped into the heart of Italy during World War II. While his primary goal was to trash a set of walking panzers before they could slaughter our boys, he was instead ambushed and taken captive, to be presumably tinkered with to no end by those pesky Nazi scientists. Writer Brian Clevinger maintains a breakneck pace from cover to cover, spicing up the action scenes with a constant touch of humor in the same vein as the Indiana Jones movies. And while this keeps the issue from feeling like the one big, long 'splosion-fest it pretty much is, every once in a while that comedy feels a bit inappropriate. The Nazis are presented as the battle-hungry war machines they always are in this kind of a situation, and while they're serious about annihilating the enemy, the Americans (usually Atomic Robo himself) are more concerned with firing out one-liners at the right moment than quickly and safely containing the enemy threat. When one soldier catches a bullet in the face and Robo is back to cracking bad puns less than a page later, it doesn't seem very fitting. Scott Wegener's fast paced, gestured artwork blends well with the issue's comical slant and frequent action scenes. Although his work does occasionally trip over its own simplicity, (when one of those walking tanks I mentioned earlier appears before a squad of US soldiers early in the issue, for instance, I wasn't sure if the enemy was a hundred yards down the road or five feet to their left) Wegener's frequent and effective use of subtle plumes of smoke and scattered dust is usually enough to fill in the blanks. Not only that, but they add an element of extreme mass and substance to the clunky, heavy machines that populate most of the book. For the majority of this issue, when the action is fast and the flavor is cheerful, Wegener is all you could ask for in an artist. On the few occasions that the narration turns more serious, such as the issue's outset, when a war-weary veteran dictates a letter home and struggles to find something hopeful to write about, the artwork is much less appropriate. Wegener never changes gears to match the mood and effect of the story, but fortunately he isn't asked to do so more than once or twice a month. If it sounds like I'm down on this series, I apologize. For the most part, this issue was loads of fun, a wild ride through a chapter of history that's usually caught up in the atrocities of war and little else. While the characters' dialog feels a bit too modern to be era-appropriate, (did Robo just quote Ghostbusters?) that's just a minor qualm, as are most of my problems with the issue. It's an enjoyably original take on a period in American history that's usually kept stiflingly sober, an excess of action and a wealth of personality. It doesn't set out to change your life, but it provides an excellent distraction if nothing else. Worthy of a borrow.